В субботу, 10 июня, работали комиссии Архиерейского Собора, а затем Преосвященные архипастыри направились на приходы Германской и Западно-Европейской епархий для совершения воскресных богослужений. В воскресенье, 11 июня, в Неделю Всех святых, митрополит Восточно-Американский и Нью-Йоркский Иларион молился и причащался Святых Христовых Таин за Божественной литургией, совершенной епископом Сиэтлийским Феодосием, первым викарием Западно-Американской епархии, в женской обители новой преподобномученицы великой княгини Елизаветы Феодоровны в Бухендорфе. Архиепископ Берлинский и Германский Марк возглавил служение Божественной литургии в кафедральном соборе святых Новомучеников и Исповедников Российских и святителя Николая в Мюнхене в сослужении секретаря Архиерейского Синода архиепископа Сан-Францисского и Западно-Американского Кирилла и епископа Сакраментского Иринея, второго викария Западно-Американской епархии. Епископ Штутгартский Агапит, викарий Германской епархии, совершил Божественную литургию в Николаевском храме г. Штутгарта, в присутствии главной святыни Русской Зарубежной Церкви – Курско-Коренной иконы Божией Матери. Его Преосвященству сослужили епископ Канберрский Георгий, викарий Австралийско-Новозеландской епархии, и заместитель секретаря Архиерейского Синода епископ Манхэттенский Николай, викарий Восточно-Американской епархии. Архиепископ Монреальский и Канадский Гавриил, архиепископ Женевский и Западно-Европейский Михаил и епископ Каракасский и Южно-Американский Иоанн служили на приходах Германской епархии, а архиепископ Чикагский и Средне-Американский Петр возглавил Божественную литургию в Иовлевском храме-памятнике мученически убиенной Царской Семье в Брюсселе (Западно-Европейская епархия). В понедельник, 12 июня, Преосвященные архипастыри возобновили работу Архиерейского Собора, выслушав доклады Начальника Духовной Миссии Русской Зарубежной Церкви в Иерусалиме архимандрита Романа (Красовского) о положении дел в монастырях, находящихся в его ведении на Святой Земле, митрофорного протоиерея Николая Артемова – об истории и дальнейших путях служения Русской Зарубежной Церкви, и протоиерея Ильи Лимбергера – о молодежном служении. Сообщения священнослужителей вызвали серьезную и задумчивую архипастырскую дискуссию по темам вышеупомянутых докладов. Ознакомившись с содержанием протокола первого дня работы Архиерейского Собора, архипастыри, после внесения нескольких поправок, одобрили его и подписали. В тот же день вечером Высокопреосвященнейший митрополит Иларион в сопровождении архиепископа Марка посетил Иовлевский мужской монастырь в Мюнхене и встретился с братией обители. Nach Beendigung der Arbeitssitzungen am vergangenen Samstag sind die Bischöfe zu verschiedenen Orten aufgebrochen, um am Sonntag Allerheiligen die Göttliche Liturgie mit den jeweiligen Gemeinden bzw. Konventen zu feiern. Am Montag haben die Oberhirten ihre Arbeit im Hl. Synod wieder aufgenommen: nach einem Bericht von Archimandrit Roman (Krasouki) über die Situation der Klöster im Hl. Land, sprach Protopresbyter Nikola Artemov über die Geschichte und die Zukunft der russischen Auslandskirche; anschließend Erzpriester Ilya Limberger über die Jugendarbeit der Kirche. Nach einer Aussprache wurde das Protokoll gebilligt. Am gleichen Tag hat Seine Eminenz Metropolit Hilarion in Begleitung von S. Em. Erzbischof Mark das Kloster in München besucht und sich mit dem Konvent getroffen. МЮНХЕН: 9 июня 2017 г. On Friday, June 9, 2017, the feast day of St John the Russian, His Eminence Archbishop Mark of Berlin and Germany celebrated Divine Liturgy at St Elizabeth Convent in Buchendorf, Germany. Praying at the service were archpastors of the Russian Orthodox Church Outside of Russia, who had arrived a day earlier. His Grace Bishop Nicholas of Manhattan then performed a moleben to begin the convention of the Council of Bishops, after which the member hierarchs proceeded to the meeting hall and sang “This Day the Grace of the Holy Spirit Gathers Us.” His Eminence Metropolitan Hilarion of Eastern America and New York, First Hierarch of ROCOR, then opened the meeting with a greeting, wishing Divine aid to all the members of the Council. The bishops, who had already interceded for the awarding of a second panaghia to their Primate, listened as Archbishop Mark read a letter from His Holiness Patriarch Kirill to the Council, and decided to appeal to His Holiness to grant the requested award to Metropolitan Hilarion. The Council then began its work; Archbishop Mark was elected Vice Chairman of the Council; and appointed as secretaries were His Grace Bishop Theodosius of Seattle, Vicar of the Western American Diocese, Bishop Nicholas and Protopriest Serafim Gan, Chancellor of the Synod of Bishops and Rector of St Seraphim Church of the Reestablishment of Unity Within the Russian Orthodox Church in Sea Cliff, NY. His Eminence Archbishop Gabriel was appointed to a committee to draft the Council’s epistle, along with His Eminence Archbishop Michael of Geneva and Western Europe, Mitred Protopriest Nikolai Artemoff, Secretary of the Diocesan Council of the German Diocese and Senior Priest of the Cathedral of Holy New Martyrs and Confessors of Russia in Munich. A Counting Committee was appointed, comprising His Grace Bishop George of Canberra, Vicar of the Diocese of Australia and New Zealand, and His Grace Bishop Irenei of Sacramento, Second Vicar of the Western American Diocese. Approving the proposed agenda, the bishops then heard reports by the ruling bishops on life in their respective dioceses, which evoked lively discussion on a wide range of matters pertaining to the ministry to monasteries, missions and parishes of the Russian Church Abroad. The Council decided to prayerfully mark the 100th anniversary of the Russian Church Abroad in 2020, for which an organizing committee was established to plan jubilee events. Archbishop Peter of Chicago and Mid-America is to head the committee. After the first day of work, the convent’s head, Abbess Maria, hosted a reception in honor of the guests. Beloved in the Lord Metropolitan Hilarion, Eminent Archpastors! I sincere greet all of you, the hierarchs of the Russian Diaspora, who have gathered in Munich to convene a Council of Bishops of the Russian Orthodox Church Outside of Russia. I am overjoyed that many of you were able to participate in the great consecration of the Church of the Resurrection of Christ and the Holy New Martyrs & Confessors of Russia in Sretensky Monastery, which took place on the feast day of the Ascension of the Lord. It was on this very feast in 2007 that, on the ambo of Christ the Savior Cathedral in Moscow, His Holiness, Patriarch Alexey II of Moscow & All Russia, and His Eminence Laurus, Metropolitan of Eastern America & New York, inscribed their signatures on the historic Act, opening for us the possibility of praising and glorifying the most-holy name of God "with one mouth and one heart," and of partaking from one Chalice of Christ. Our joint services in this newly built church became our common grace-filled prayer to the Lord, Who by His omnipotent right hand led us to the desired unity. Today, a decade later, we bear witness to the good fruits of this unity, fully sensing ourselves members of a single ecclesiastical organism. Expressing my gratitude to you for your selfless Orthodox witness, I call upon you to continue with the same fervor to "edify the body of Christ" (Ephesians 4:12). To mark the 10th anniversary of the signing of the Act of Canonical Communion, and in recognition of the your zealous labors in strengthening the spiritual unity we have recovered, I deem it worthy to bestow upon the First Hierarch of the Russian Orthodox Church Outside of Russia, His Eminence Hilarion, Metropolitan of Eastern America & New York, the right to wear two panagias within the spiritual territory entrusted to him. I invoke God’s blessings upon the efforts of the Council of Bishops of the Russian Church Abroad. On June 12, 2017, the Council of Bishops of the Russian Orthodox Church Outside of Russia, convening at St Elizabeth Convent in Buchendorf, Germany, heard a report by Archimandrite Roman (Krassovsky), Chief of the Russian Ecclesiastical Mission in Jerusalem, on the state of affairs in the Holy Land. Among the matters discussed was the Orthodox Bethany School for Girls, which this year celebrates the 80th anniversary of its founding. Elevating the educational levels of Muslim Arab children, helping their future careers and family life, and hindering the possibility of their radicalization. Orthodox Bethany School is a unique educational institution and has contributed a great deal towards the friendly relations among the peoples of the Holy Land. The Council of Bishops therefore calls upon all social structures in the diaspora (including the Fund for Assistance to the Russian Orthodox Church Outside of Russia, the “FfA”) and in Russia, all people who value the importance of this region, to support Bethany School for Girls. Also, in recognition of the ten years of service by Nun Martha (Wall), the Council of Bishops expresses its profound gratitude to her for her work to the benefit of the souls of Arab girls and teenagers, and prayerfully invokes Divine blessings upon her and her school. On Tuesday, June 13, 2017, after Divine Liturgy, the Council of Bishops of the Russian Orthodox Church Outside of Russia convened at St Elizabeth Convent in Buchendorf, Germany, reviewed and signed the minutes from Day 2 of the gathering. The Council then heard a report by Protodeacon Denis Lvov, manager of the Synodal candle factory, and a report by the Treasurer of the Synod of Bishops, Subdeacon George Schatiloff. 1) To bolster youth ministry in Central and South America. Towards this end, to find a coordinator for youth ministry in South America, who is to be instructed to join with other youth leaders to develop a plan to organize a youth conference in Latin America. 2) To insist that in every diocese, each parish nominate a youth representative (preferably two) to be the contact person for youth work. 3) To see to it that in every diocese, youth representatives participate in diocesan and parish councils, so that youth ministry remains on the permanent agenda. This should encourage new ideas for youth projects, and will serve to broaden and deepen existing projects. 4) To encourage large parishes to establish youth committees or councils to help the rector in youth ministry. 5) To see to it that parishes donate towards youth ministry on an annual basis. Youth leaders should have the opportunity to manage these funds independently, yet be held accountable before diocesan assemblies. It is desirable that a diocesan youth representative and youth coordinator receive a modest stipend in order to ensure active work and responsibility. 6) To appeal to the Fund for Assistance to the Russian Orthodox Church Outside of Russia to finance a conference of diocesan youth leaders and small delegations of youth delegates with the aim of strengthening contact between diocesan youth groups, to exchange ideas and develop new projects. Such conferences should be held at least once every three years in various countries. 7) To appeal to diocesan activists and benefactors to seek out funding for youth pilgrimages to holy sites both within each country and in other countries (the Holy Land, Russia, Greece, etc.). We, the hierarchs of the Russian Orthodox Church Outside of Russia, gathered for a Council of Bishops in the God-preserved city of Munich during the celebration of the Pentecost, in the blessed presence of the Kursk-Root Icon of the Mother of God "of the Sign.” This year we remember with sorrow the hundredth anniversary of the terrible, bloody events of 1917; we are at the same time filled with joy over the anniversary of the restoration of the patriarchate and the tenth anniversary of the reestablishment of unity within the Russian Church. We remember those who labored towards the reestablishment of unity, and those who continue to work towards strengthening of our spiritual bonds. On the feast of the Ascension of the Lord, we prayed together with the Patriarch of the Russian Orthodox Church and the President of the Russian Federation at divine services during the consecration of the Church of the Resurrection of Christ and the Holy New Martyrs and Confessors of Russia at Lyubanka, and we conclude our assembly with the great consecration of the Cathedral of the Holy New Martyrs and Confessors of Russia in the city of Munich, the only church of the Russian Church Abroad where His Holiness Patriarch Alexy II of Moscow and All Russia once served, who had together with Metropolitan Laurus of blessed memory signed the Act of Canonical Communion. We always knew that the external unity that was once rent asunder was always preserved in the spiritual plane. With gratitude with God, we also mark the hundredth anniversary of the birth of a New Martyr of Russia who manifested the phrase “the blood of Christian martyrs is the seed of faith.” St Alexander (Schmorell) of Munich spilt his blood in Germany. The hundredth anniversary of his birth is marked by the completion of the construction of a church not far from his grave. The cathedral was consecrated by His Beatitude Metropolitan Onouphry of Kiev and All Ukraine along with the Primate of the Russian Church Abroad, His Eminence Metropolitan Hilarion of Eastern America and New York, along with all of his fellow bishops, bishops from Russia and Ukraine and of other Local Orthodox Churches. In the global podvig of the Russian New Martyrs, among them St Alexander, the East unites with the West. The restoration of the patriarchate at the All-Russian Council of the Russian Church, the hundredth anniversary of which we now celebrate, was a positive step towards the return to our Christian roots, to the 1,000th year of existence of our Church organism. A leading role in the reestablishment of the patriarchate was played by a hierarch who himself became the first Primate of the Russian Orthodox Church Outside of Russia, Metropolitan Anthony (Khrapovitsky) of Kiev and Galicia of blessed memory. Based on the work of the Pomestny Sobor [All-Russian Church Council] of 1917-1918, he and his brother archpastors preserved church sobornost’[collegiality] in distant lands, and in this way, fealty to the legacy of the Mother Russian Church. The theology of Metropolitan Anthony returned the cognizance of the Church to her patristic roots; it cleansed Russian theology from imposed alien influences and in many ways determined the theology of the Church Abroad, and manifested itself in the legacy and practice of pastoral ministry. The triumph of the sobornost’ of the Russian Church and her New Martyrs lies in the fact that despite the crumbling of the Orthodox empire and the imposition of a regime whose ideological goal was to fight God and everyone who believes and worships Him, faith in the truth and the Church could not be destroyed. In light of the apostasy that began in earnest in the 19th century, the podvig of bearing witness to the faith “even unto death” is especially significant, just as the image of the purity of family life of the last Russian Emperor was. We are all called upon to make sense of the spiritual life of the peoples of Russia and of the whole world. Today entire peoples both in the Fatherland and abroad face a choice: spiritual cultivation of the soul or utter devotion to material well-being. God forbid that we once again see the brutal consequences of the deceptive spiritual and moral choice of willingly sacrificing our souls to evil substitutions. That is why once again raise the call to conscientious purification, not in the political sense, but for the sake of obtaining spiritual succession, gazing upon the path of the New Martyrs, and to bid farewell to the symbols of militant atheism, rid ourselves of the old glorification of murderers by naming cities and towns after them, streets and plazas, train stations and parks; we call for the removal of the body from the central square of the nation of the one whose name is connected with the establishment of the militant atheist state, which led to the sacrifice of millions of lives to its ideology. Returning to our Christian roots is our moral choice. It is built on the search for God, church life, learning about faith, growth and strengthening of our moral podvig. It is from our parents that we must receive our first experience of knowledge of God, of prayer, participation in the Mysteries—we call upon all parents to tend to their own spiritual edification, and not only in word, but to teach their children by example. It is the family itself, the “little Church,” that the full understanding of church life is created. The expulsion of multitudes of people from Russia introduced the Wes to Orthodox Christianity. Divine Providence, even the loss of goodness had positive results. Today, Orthodox Christians living in the West, where the family unit is in crisis, are called upon to serve as an example of moral purity in their own lives in their communities, both in Christian family life and in the monastic service. Bearing all of this in mind, let us courageously declare in the shining joy of the Church, together with Holy Apostle Paul and St John of Kronstadt, the Martyred Royal Family and the multitude of New Martyrs and Confessors of Russia: “I can do all things through Christ which strengtheneth me” (Philippians 4:13). Signed by all the participants of the Council of Bishops. 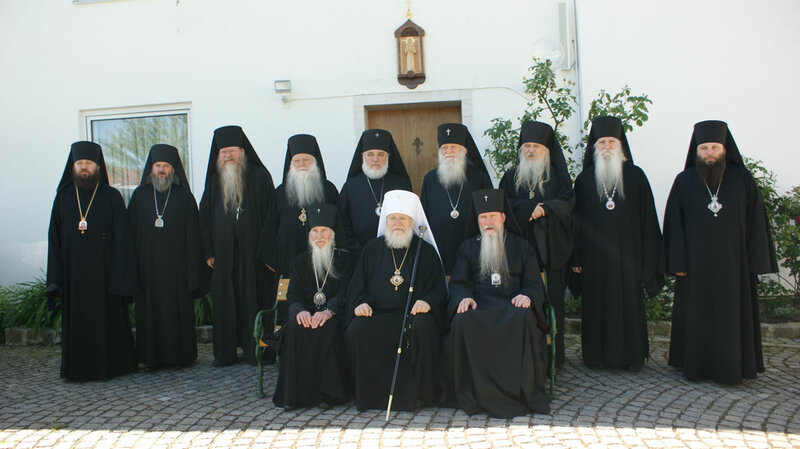 We, the hierarchs of the Russian Orthodox Church Outside of Russia, having gathered for a regular session of the Council of Bishops, which is taking place in St Elizabeth Convent near Munich, wish to express to you our heartfelt gratitude for the fact that during the blessed days of the celebration of the 10th anniversary of the reestablishment of unity within the Russian Orthodox Church, you found time to meet with us at Sretensky Monastery. We will never forget your participation in the preparation of this unity, which was achieved through great effort and was long desired by all of Orthodox Rus’, both in the Fatherland and in the diaspora. By Divine mercy and the prayers of the Most-Holy Queen, the Mother of God and Ever-Virgin Mary, and all the Russian Saints, the miracle of Church unity has been accomplished, and you were among those whom the Lord called to manifest His will for the Russian Church. We congratulate you, honorable Vladimir Vladimirovich, on the recent Day of Russia, and prayerfully wish you the perpetual aid of the Lord in your labors towards the benefit of our God-preserved Fatherland.